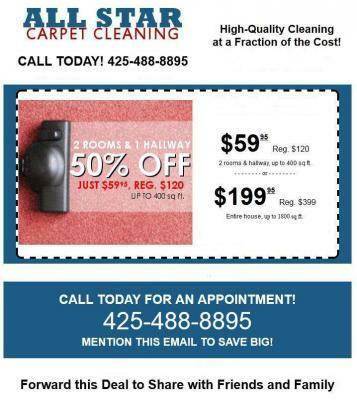 Professional carpet cleaning in Bothell, Wa. Carpets can be a haven for fungi and molds. They are very warm in nature that is why they become conducive for growth of these elements. When molds are formed, they will cause skin allergies to sensitive skin. When you clean your carpet, you will be able to avoid the formation of molds. The use of chemicals will destroy the sources of fungi and molds. Nothing could be a greater feeling than walking across your carpets that are professionally cleaned. Carpets are expensive home investment so maintaining their original beauty with professional carpet cleaning in Bothell, Wa.will save you the big cost of replacing a damaged carpet. Having carpets that are cleaned by professional carpet cleaner ensures safety and good health to your family. Vacuuming the carpet is not the only thing that you must do regularly. All Star Carpet cleaning can do more than this for you so you will have your carpet clean the rest of the years they are expected to last. Vacuuming could be useful for many reasons; however, it cannot remove bacteria and germs. These need special products and equipment to keep them free of dirt. All Star Carpet Cleaners has the ability not only to ensure the cleanliness of your carpets but also to maintain the quality and color of your carpets. This is because they treat your carpets with the appropriate carpet cleaning agents. These professionals have all the knowledge to perform their job effectively and satisfactorily. They offer an extraordinary cleaning system that will surely satisfy customers. Not only does carpet cleaning make wonders in your homes, but will make your working environment safe and healthy as well. Maintaining the carpets in your office as well as your home will save you from making unnecessary purchases. Whether you are a one man brand or a multinational corporation, it is necessary that you keep a professional identity. A refined environment is a means to ensure a good image to your customers. By having your carpets frequently cleaned by professionals, you are minimizing the possibility of future damages, discoloration and stains of your carpets.